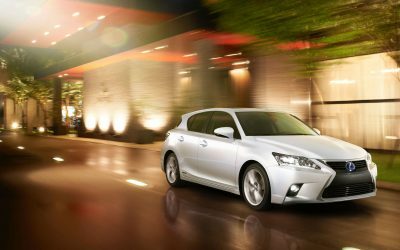 The updated 2014 Lexus CT 200h & CT 200h F SPORT debuted at the Guangzhou Motor Show today — still waiting to see live photos from the show floor, but here’s the full press release and a new collection of photos. GUANGZHOU, China (Nov. 21, 2013) — Mean and green, the Lexus CT 200h compact luxury hybrid showed off its new front fascia at the Guangzhou Motor Show premiere in China. 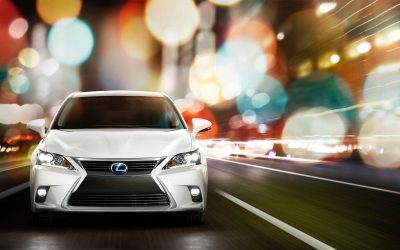 In addition to a new grille, the updated hybrid also offers more dynamic, sophisticated exterior styling, a refined interior with upgraded equipment, and enhanced driving performance for the 2014 model year. 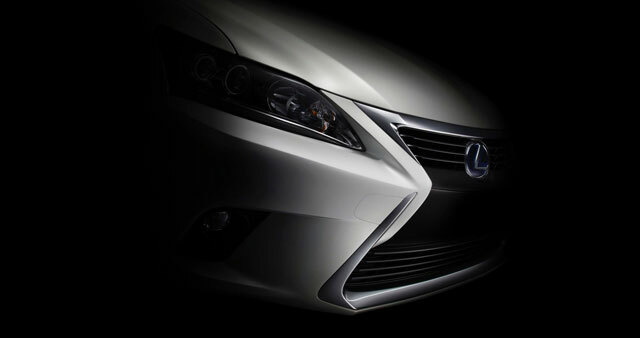 In addition, the available F SPORT model features create a distinctive look. 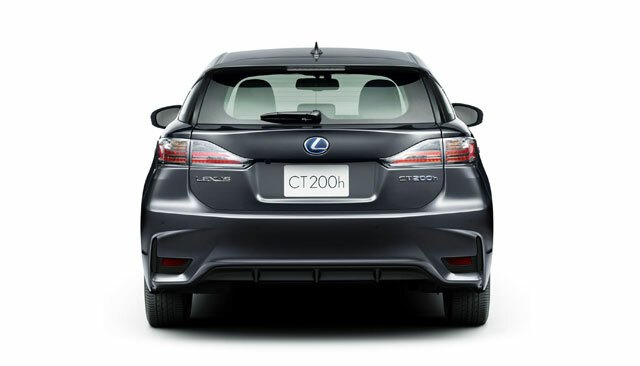 The front of 2014 CT 200h introduces a new Lexus “spindle grille” design. The center has been pushed forward to create a powerful, more three-dimensional form. The bottom corners are spaced wider and the spindle ‘pinch point’ has been lowered, reinforcing the CT 200h’s low front profile and wide, sporting track. 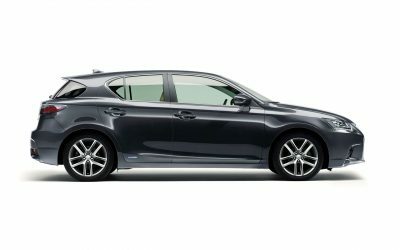 In profile, the new 2014 CT 200h sports newly developed, 10-spoke, 16-inch and 17-inch alloy wheels, or a new shark fin-style roof antenna. To the rear, a new bumper design features a more horizontal structure. Distinctive, L-shaped reflector housings are incorporated on the bottom corners. A black lower center section emphasizes the vehicle’s low center of gravity and broad rear stance. 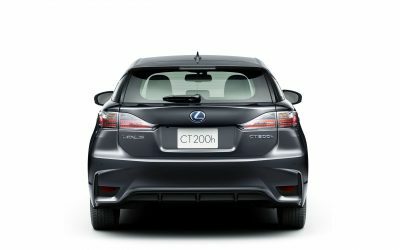 The new CT 200h is available in a choice of six body colors including an all-new Lexus red. 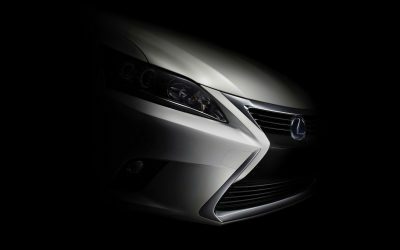 A Lexus first, a sporty black roof is available with six color schemes to provide a unique two-tone look. All exterior paint now benefits from a scratch-resistant, self-restoring top coat. The driver benefits from a new, 14.6-inch diameter steering wheel. The Optitron instrument panel is now available with a 4.2-inch TFT (Thin Film Transistor) screen which may be linked to the multimedia system and controlled via steering wheel-mounted switches. The available center screen is now fixed and thinner. The second generation Remote Touch Interface (RTI) features a new, more user-friendly push entry control switch. The Lexus Display Audio (LDA) and Electro Multi Vision/Navigation (EMV/N) multimedia systems feature added functions, improved operability, enhanced hands-free, voice recognition control and a new, center-console-mounted controller. The sound quality of the Lexus audio system has been enhanced by the adoption of the world’s first bamboo loudspeaker technology. Bamboo fiber, plant opal and charcoal are combined in an injection molding process to create the industry’s thinnest loudspeaker diagram, which results in noticeably improved sound quality. Additional equipment upgrades include the availability of rear view and backup monitors for the LDA system, as well as Intuitive Parking Assist, a Tire Pressure Warning system and a Traction Control “Off” switch. The CT 200h offers revised center console trim colors and combinations for 2014. A new door panel trim and upholstery design incorporates stitching for added visual quality. A choice of five trim finishes now includes Shimamoku, or “striped wood.” Anew, more sophisticated, metal film finish has been added to the center console switchgear. 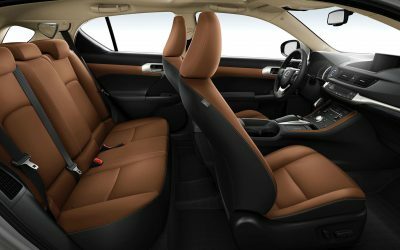 Interior upholstery choices include leather or Lexus NuLuxe in Black, Caramel, Flaxen and Parchment. Increased body rigidity has also allowed for suspension re-tuning. Coil spring rates have been optimized, a new shock absorber valve adopted, and the rear stabilizer bar diameter altered to enhance ride comfort with no loss of handling agility. Complementing the inherent quietness of the Lexus Hybrid Drive powertrain, more than 94 separate measures have been adopted to further reduce NVH. 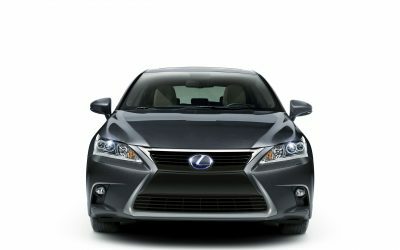 A Lexus hybrid first, a new inlet duct design realizes both excellent intake efficiency and a high level of quietness. 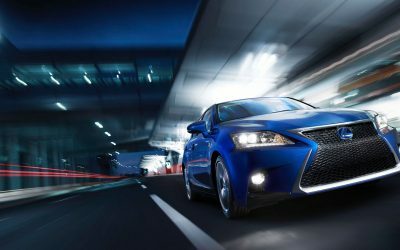 The 2014 CT 200h F SPORT has been designed with a more powerful road presence, to give it a stronger differentiation from the standard CT 200h. A new spindle grille design features the same aggressive mesh pattern as that of the new IS F SPORT, which is reversed between the upper and lower sections. The fog lamp housings share the same mesh finish, and are underscored with a fin also finished in black. Seventeen-inch, 10-spoke alloy wheels feature an F SPORT-unique surface treatment. The vehicle is available in a choice of nine exterior colors including F SPORT-exclusive White Nova, and seven two-tone colors with a black roof. The F SPORT interior features exclusive upholstery, ornamentation and trim. 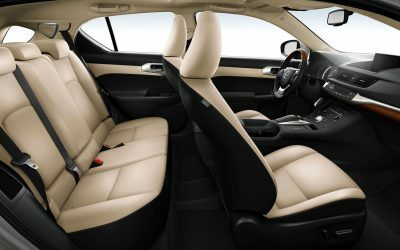 The seat upholstery has been upgraded with synthetic leather side bolsters and headrests, fabric center panels and enhanced stitching. A choice of four F SPORT-exclusive color schemes includes a newly developed Slate Grey. 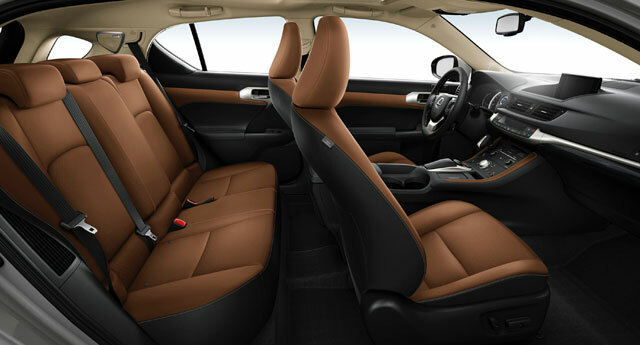 Full leather upholstery is also available, in a choice of Black or Dark Rose. 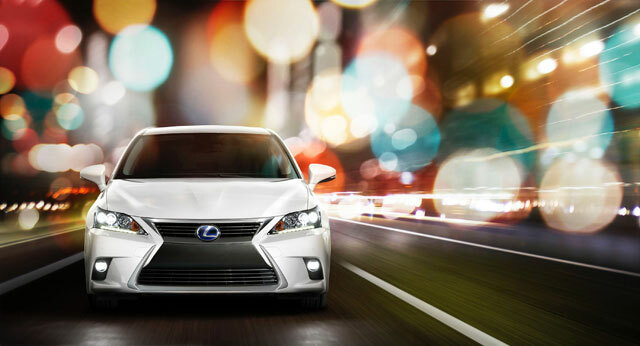 A choice of four trim finishes includes F SPORT-exclusive Wedge Metal. 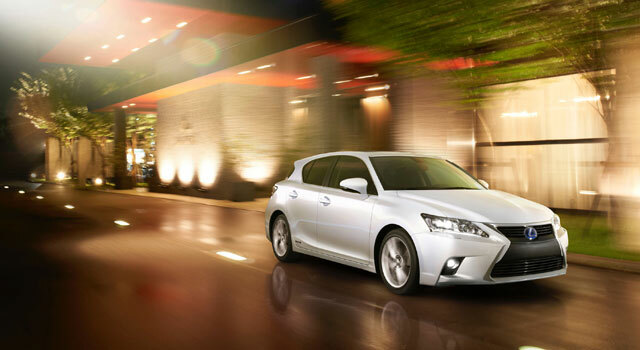 The F SPORT features all the driving performance enhancements of the 2014 CT 200h model range. In addition, it benefits from sport-tuned coil spring settings and optimized front/rear roll rigidity distribution to further enhance its sporting driving dynamics. In addition to its alluring style the CT 200h has one of the best EPA-estimated fuel economy ratings in its segment with a combined rating of 42 mpg, 43 mpg city and 40 mpg highway. 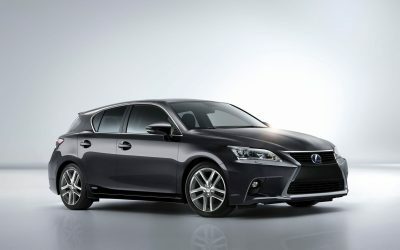 Andrewz2: The new spindle grille for the Lexus CT 200h looks SO NICE!